← The Week in Tiki (March 16, 2015): Miller to remain in Big Apple; Tiki weekenders sell out in Chicago, N.J. 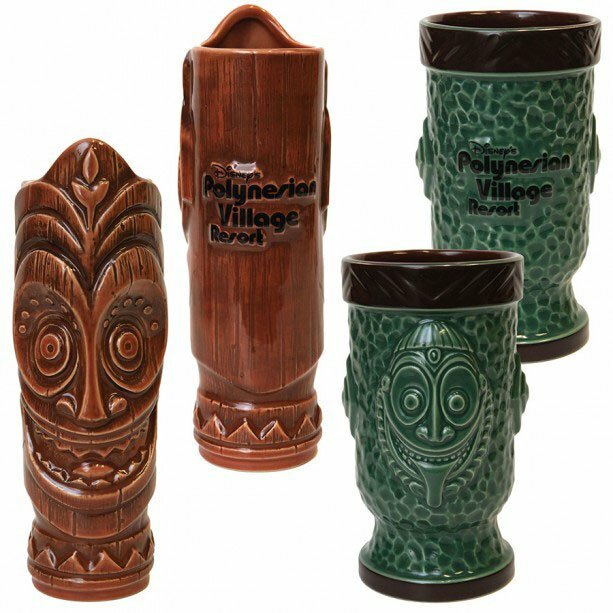 The latest news from Disney’s Polynesian Village Resort includes the pending opening of Trader Sam’s Grog Grotto, plus DVC and construction updates plus new resort merchandise. There’s also news on a possible Jungle Cruise restaurant coming to the Magic Kingdom, plus a preview of next month’s Miami Rum Festival. Weekly features spotlight artist N! 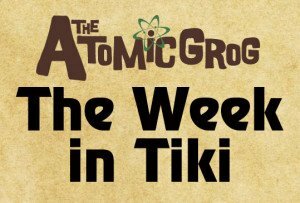 Satterfield, Tikiman’s Polynesian Village Resort website, surf rockers The Intoxicators, and Three Dots and a Dash in Chicago. The rum of the week, El Dorado 12, is featured in the El Dorado Mai Tai. A rendering shows the reimagined Great Ceremonial House at the Polynesian Village Resort, including a scaled-down water feature and recently added Tiki in the middle of the lobby. There’s lots of activity at Disney’s Polynesian Village Resort this week as the soft opening of Trader Sam’s Grog Grotto approaches. On Monday, the long-awaited “Poly Tiki” appeared on top of the new fountain and rock formation in the Great Ceremonial House. And all week there have been sneak previews of both Trader Sam’s and the new Bora Bora Bungalows, both scheduled to officially open on Wednesday, April 1. Meanwhile, work continues frantically on the refurbished pool and patio outside the Great Ceremonial House. Inside the massive lobby, which recently completed an extensive refurbishment (see our previous coverage), the resort’s signature logo Tiki made his appearance in the early a.m. hours Monday. It’s the last stage of the new rock waterfall centerpiece, as pictured in concept artwork released in the early stages of the project (see above). Though Polynesian Resort purists have bemoaned the loss of the original plantscape and water fall, which dominated the entire lobby, many are calling the new design much more friendly and inviting. In fact, the final touch will be the addition of leis draped across the Poly Tiki’s arms, welcoming visitors to his refurbished domain. Disney World cast members (employees), Disney Vacation Club (DVC) members and VIPs have been treated to tours of the 20 new timeshare units perched over the water off the beach of resort, with picturesque views of the Magic Kingdom. These deluxe, 1,650-square-foot vacation retreats – which sleep eight and include two bedrooms, two bathrooms, and a full kitchen – don’t come cheap. They could cost anywhere from $2,100 to $2,900 per night, depending on season. But the bungalows are sure nice to look at. 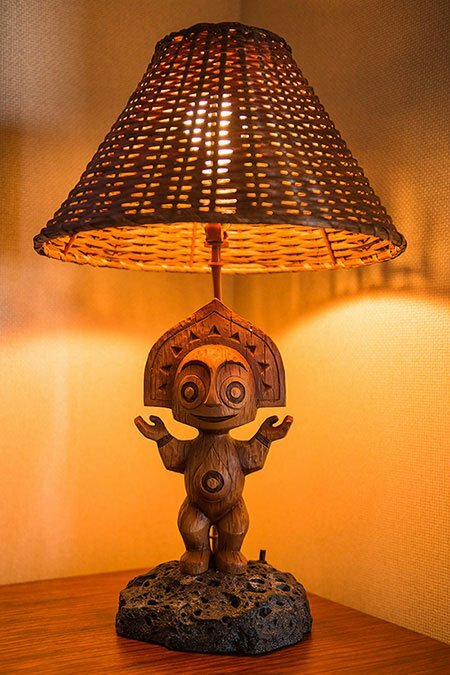 There’s lots of mid-century, tropical and Tiki decor, including Mary Blair-inspired bed throws, a Poly Tiki lamp and other vintage-styled lighting, hanging wicker chairs, handcrafted wind chimes, Bora Bora vacation posters, and much framed Tiki artwork. There’s even framed artwork from Disney icon Annette Funicello’s Hawaiiannette album. Of course, the bungalows also have luxury additions, such as an in-mirror TV in the master bath, a washer and dryer in each unit, plus what appears to be a remote-controlled climate control system. To many, what makes the bungalows worth the price is the private deck that features a small plunge pool and a front-row seat for the nightly Electrical Water Pageant and Magic Kingdom fireworks. 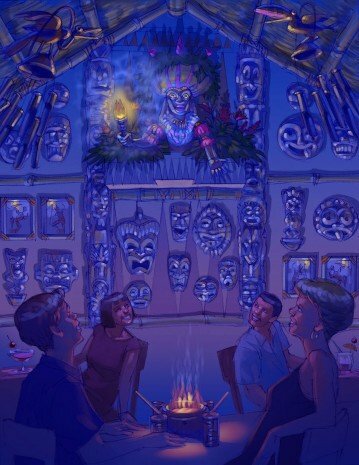 Concept art shows Uh Oa, the Polynesian goddess from the old version of Walt Disney’s Enchanted Tiki Room at the Magic Kingdom, on the wall of Trader Sam’s Grog Grotto. * The official opening is the same as the bungalows: April 1, with a media preview on March 31. However, nightly sneak previews have given credence to the reported soft opening this week. 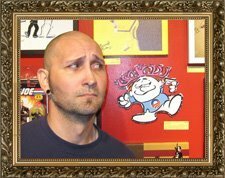 The date most mentioned is Thursday (March 26), but Steve “Tikiman” Seifert just posted on Facebook that some things are not quite ready so it most likely will not be open to the public until perhaps Friday or Saturday at the earliest. The delay is probably related to the patio and pool. Photos and reports have shown concrete still being poured, and official letters to guests now say that the Lava Pool will not be open until mid-April. * Trader Sam’s is expected to be open from 4 p.m. to midnight, with the inside bar limited to ages 21 and older after 8 pm. Note that this would be more limited than Trader Sam’s in Anaheim, which is open from 11:30 a.m. to 1:30 a.m. There’s seating for 50 inside and 80 outside on the patio. There will be no advance reservations, but a cast member at a host stand will take names and hand out pagers so guests can relax in the Great Ceremonial House and not have to wait in line. * It appears that many of the Tikis from outside the original Enchanted Tiki Room at Disneyland are being installed on the patio. * A cast member who attended one of the previews said the decor inside the bar is predominately Tiki, with some nods to the old 20,000 Leagues Under the Sea attraction. A bookcase features South Pacific and Tiki references, while Tiki mugs and artifacts from other Tiki locations are on display. * The small bites menu includes pork tacos, sushi roll, chicken lettuce cups, fried Portuguese sausage bites, dumplings with sesame soy dipping sauce, and tuna poke. 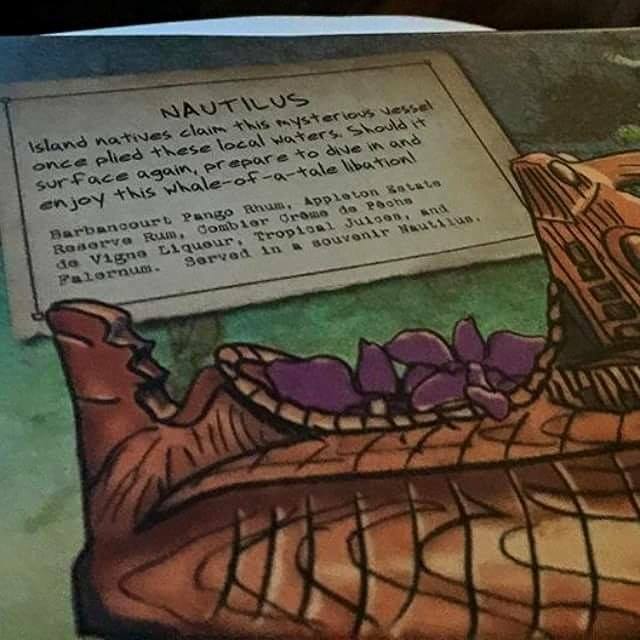 A photo circulating on Twitter shows the Nautilus on the Trader Sam’s Grog Grotto cocktail menu. 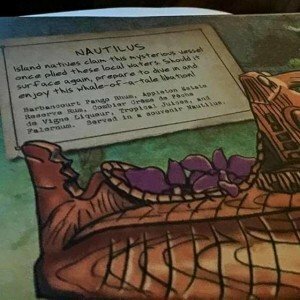 * The Grog Grotto bar menu includes 12 specialty cocktails and three non-alcoholic drinks, just like the Enchanted Tiki Bar. There’s also a rum flight. Most of the drinks come in souvenir Tiki mugs and feature special effects and/or interaction from the staff. This includes lighting and audio effects that envelope the entire bar. There’s also a selection of wines and beers, including a flight of Kona beer from Hawaii. * If you order the Nautilus, you’ll hear Captain Nemo from 20,000 Leagues Under the Sea shout orders and see several animated effects (involving a diver’s mask filled with water, a painting of the Nautilus, and a squid tentacle holding a bottle of rum). The Nautilus souvenir bowl will be available for purchase eventually, but it won’t be ready for the opening. It’s expected to cost more than $50. * If you order the Uh Oa! (a drink from Trader Sam’s at Disneyland), the room fills with chanting and storm effects, then lights reveal Uh Oa, the Tiki Goddess of Disaster from the “Under New Management” version of the Enchanted Tiki Room at the Magic Kingdom (see rendering above). Perched above a thatched roof over one of the booths, Uh-Oa asks “Who dares disturb the Tiki gods?” while her eyes light up. * The other drink with an animated effect is Krakatoa. The rest of the drinks have either a sound or a “bartender action.” The Hippopoto-Mai Tai comes with a sound effect of a hippo on the roof, followed by two gun shots and the bartenders yelling, “Two shots of rum!” When you order the Polynesian Pearl, a giant clam shell illuminates while a bartender reaches in to pull out a mug for the drink. * Two new Tiki mugs (see photo) featuring artwork from the resort. We got a sneak peek at these back in September during Mahaloween at Trader Sam’s in Disneyland (see story). The parks blog said three additional color variations for each mug will be released throughout the year at the resort’s merchandise shops. Note that these will be in addition to all the mugs available at Trader Sam’s Grog Grotto. * A new resort open edition pin, plus two Trader Sam’s Grog Grotto pins: one open edition and another limited edition for the grand opening. Other souvenir items include a key chain, frame, and window decals. * Two new aloha shirts, one (for both adults and kids) featuring character sketches and the Poly Tiki, the other (No. 1 on my wish list) inspired by Trader Sam’s Grog Grotto and featuring colors once included in the tile inside the Great Ceremonial House. All the items will be released exclusively at the resort this year and will not be available online, according to the parks blog. Jungle Cruise themed restaurant coming to Magic Kingdom? The Aloha Isle and Sunshine Tree Terrace snack stands recently switched places in Adventureland, apparently to clear up congestion and make way for the restaurant. [Disney Food Blog story and photos] The Adventureland Veranda operated from 1971 to 1994, but in recent years has been used mainly for character meet-and-greets and special events. The Skipper’s Cantina back story involves Jungle Cruise skippers opening a restaurant to supplement their meager pay, according to WDWNT. No word on if this would include staff and servers delivering puns, jokes and one-liners along with the food and drinks, in the fashion of the iconic attraction that dates back to 1955 at Disneyland. Rumors say the restaurant may offer a counter-service lunch and a table-service dinner, similar to Be Our Guest in Fantasyland, and could open late this year. Be Our Guest broke the Magic Kingdom’s long-standing rule against alcohol (at dinner only), so there’s also speculation that the new Adventureland restaurant could do the same. Perhaps the selection could include cocktails from the defunct Adventurer’s Club from Downtown Disney, as well as Trader Sam’s Enchanted Tiki Bar (Disneyland) and Trader Sam’s Grog Grotto (about to open at the Polynesian Village Resort at Disney World). Some of the many rums coming in 2015 to Miami Rum Renaissance Festival. 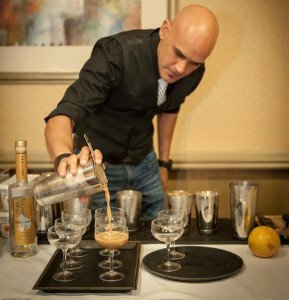 With anticipation of the seventh annual Miami Rum Renaissance Festival building, organizers released more details on the April 17-19 rum tastings, seminars and awards, plus the additional events held April 13-19 during Miami Rum Fest Cocktail Week. One of the best things about the festival is the opportunity to taste new rums that may not yet have had the opportunity to break into the rough American retail market. 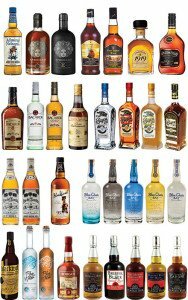 This year, organizers promise emerging rum brands from South Florida, Georgia, Antigua, Barbados, Grenada, Haiti, Jamaica, Panama, St. Vincent, Trinidad, Guyana, Suriname, Austria, Denmark, Japan, Philippines and India – all making their U.S. debut at the festival. “We’re seeing a huge increase in brands from other countries and new craft spirits that have not previously presented their products in North America,” said Robert A. Burr, host and organizer of the Miami Rum Renaissance Festival and Trade Expo, along with wife Robin and son Robert V. Burr. By showcasing new products and attracting experts from around the globe, the festival has become a key industry event. With this in mind, the International Trade Expo for Rum has been created within the festival to help rum producers, importers, distributors and retailers network and unite to boost rum’s growing popularity. 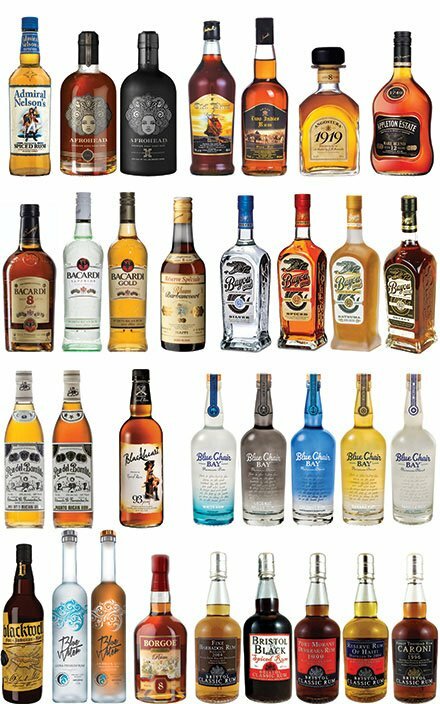 In 2014, around 26 million cases of rum were sold in the United States, with the premium category growing 14.8 percent and the spiced rum category growing 11.6 percent, according to Burr. The event is the largest rum festival in the world, luring experts, professionals and enthusiasts from more than 30 countries. The Grand Tasting events will be held April 17-19 at the Doubletree by Hilton Miami Airport Convention Center. Included with admission are expert seminars, live entertainment, island lifestyle vendors and interactive cocktail demonstrations. Tickets are $50 for Sunday general admission, $75 for a Saturday VIP pass, and $100 for a three-day VIP pass. In a change from past years, tickets must be purchased in advance via MiamiRumFest.com or by phone. No tickets will be available at the door. Miami Rum Fest Cocktail Week will include rum and cocktail events at acclaimed bars and lounges throughout South Florida. 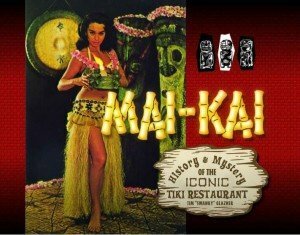 Already announced is the annual Tiki Night at The Mai-Kai on Tuesday, April 14. Look for other locations to be announced soon. One of last year’s highlights was the kick-off party at The Broken Shaker in Miami Beach. When one thinks of Tiki, one doesn’t typically think of stencil and spray-paint art. But South Florida’s N! Satterfield has combined his many passions into a collective work of art that transcends both Tiki and urban art. Colorful and whimsical yet still gritty and tribal, his many works on boxes, pieces of wood and other objects reflect a subversive bent that’s consistent with the artist’s personality. Nik, as he’s more easily referred to, has had his works appear in gallery shows both near and far (Florida, New York, California, Austria, Romania, etc.) and at events such as The Hukilau, Miami Rum Festival, and the South Florida Day of the Dead Celebration. He has a knack for taking any image or symbol, re-contextualizing it, and “ultimately liberating it.” Nik calls this simple process “21st century urban folk art,” and it’s fascinating to gaze upon. What started as a simple yet passionate hobby – creating a modest web page in 1999 to document the history and provide tips for enjoying Disney’s Polynesian Village Resort – has grown into a one of the most elaborate and informational hubs for any Disney resort. A Californian who spent his youth visiting Hawaii, Steve Seifert (better known as Tikiman), was frustrated by the lack of information available about his favorite Disney World hotel, so he took matters into his own hands on the nascent Internet. Now, 16 years later, his site has grown into a crucial resource for guests and drawn a passionate audience of fans who obsess about every detail at the resort. Along the way, Seifert has also grown into a role as citizen journalist, chasing rumors and reporting updates on crucial refurbishments by cultivating his own reliable sources within the Disney company. 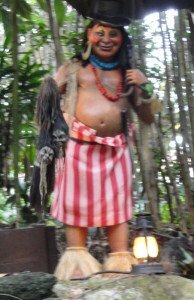 His role as a one-man wire service for Polynesian news reached its peak over the past several years with the arrival of Disney Vacation club, the construction of DVC time-share bungalows off the beach, and the massive renovations that include the imminent arrival of Trader Sam’s Grog Grotto. Lacking official announcements from Disney, he was among the first and most reliable to report all of those events. Meanwhile, Seifert’s Facebook page has become an extension of the website, allowing him and his many followers (more than 14,000 at last count) to post photos and updates almost daily. Which came first: The Hukilau or The Intoxicators? The event and the band have become so intertwined, it’s hard to remember. For the record, the instrumental surf band formed in Tallahassee in 2001, a year before The Hukilau first launched in Atlanta. 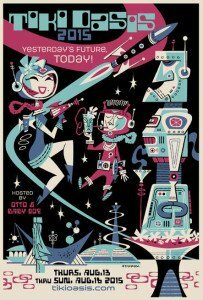 But since 2005, the two have joined forces and grown in tandem to become mainstays in the modern Tiki scene. Gary Evans (guitar), Brian Crum (drums), and Adam Watson (bass) can also be found playing up and down the East Coast and on road trips across the country. The band’s powerful blend of classic surf, rockabilly, and instrumental rock has earned it slots opening for Los Straitjackets. Agent Orange, Southern Culture on the Skids, and many more. The band’s sweaty live shows are its trademark, but the CD releases (I Dreamed the Best Part and Journey to the Center of the Earth) manage to capture that live energy. Outstanding tracks include Magnolia Swamp, The Goat, The Secret Ingredient To Chinese Food, and Phantom Mustang. 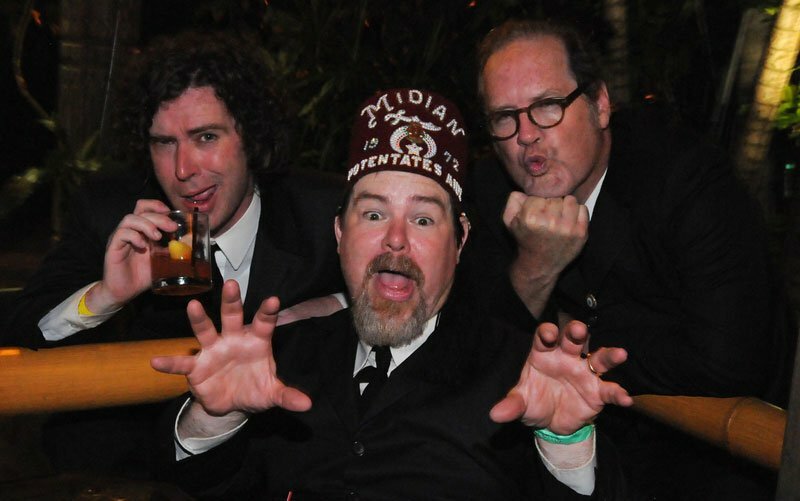 You can catch the band (of course) at The Hukilau this June in Fort Lauderdale. Three Dots and a Dash official photo. 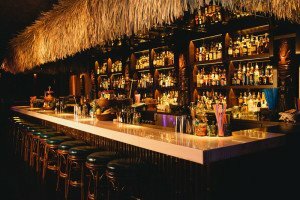 Launched in July 2013, this Chicago hotspot named for a classic Don the Beachcomber cocktail has quickly become one of the elite bars of the Tiki revival. The brainchild of master bartender Paul McGee, it was named Best New American Cocktail Bar in the 2014 Spirited Awards at Tales of the Cocktail. McGee has since moved on to open a new Tiki-inspired bar, Lost Lake, in late 2014 but Three Dots and a Dash continues with his vision of classic Tiki in a modern craft cocktail wrapper. You’ll find a perfectly executed Zombie, Pearl Driver and Jet Pilot as well as the bar’s namesake and a variety of new creations, many in souvenir mugs and most with elaborate garnish and presentation. Despite the bar’s tucked-away location down an alleyway, it’s always bustling and can become crowded on weekends with a downtown club crowd. Try to visit early and on weekdays to enjoy the atmosphere and decor, which are also top-notch. There’s also a nice menu of small Polynesian-style plates, including crab rangoon, spare ribs and coconut shrimp. One of the signature luxury cask aged rums produced by Guyana’s venerable Demerara Distillers, this smoky and savory 12-year-old rum is perfectly balanced, fruity and spicy sweet but not overwhelmingly so. Tropical fruits mingle with brown sugar, vanilla and a host of spices to create a great sipping rum and high-end mixer. El Dorado 12 came in at No. 3 in The Atomic Grog’s rum rankings in August 2013. Shake lightly with ice cubes and strain into a Mai Tai glass or Tiki mug filled with crushed ice. Garnish with lime wedge and mint sprig. This stripped-down Mai Tai recipe from the bar at the upscale Brooklyn crab shack was featured on the Zagat website last April. It’s similar to the Trader Vic’s classic but foregoes sugar syrup and the pungent agricole rum. 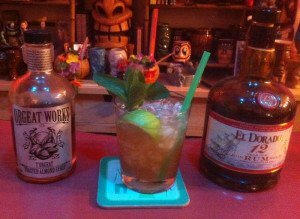 While most Mai Tai recipes feature dark Jamaican rum, it’s also not unusual to see a Demerara rum featured (see Martin Cate’s Mai Tai). I took the opportunity to also show off an outstanding new artisanal orgeat syrup hand-crafted in Brooklyn by Adam Kolesar’s Orgeat Works. The result is a great showcase for the sweet/smoky El Dorado 12 and complex/nutty T’orgeat Toasted Orgeat. It’s a sweet and savory explosion of flavors that bring to mind both the vintage Mai Tai and the rich style of tropical drinks featured at The Mai-Kai in Fort Lauderdale. To round out this decadent Mai Tai, don’t cut corners on the curaçao. Use Pierre Ferrand or another high-end brand. 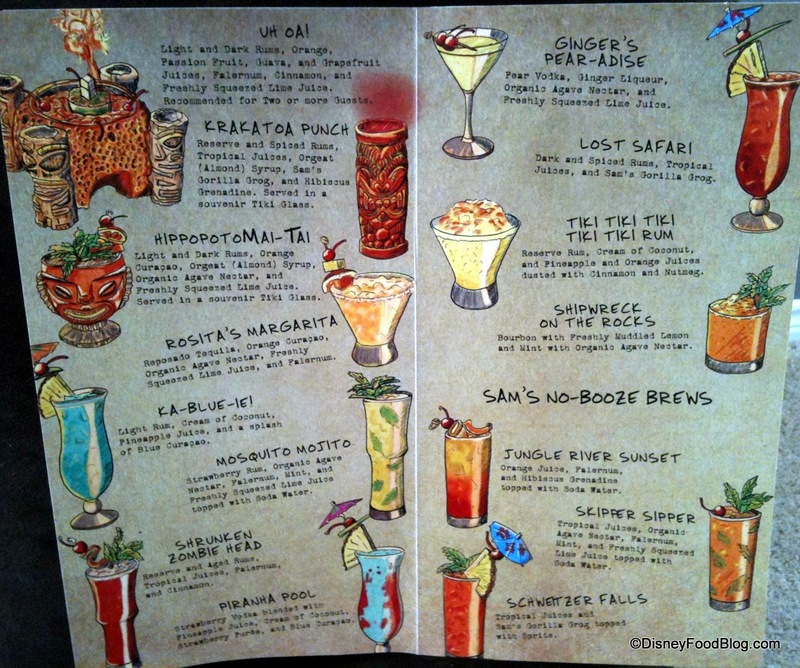 This entry was posted in 2015, Cocktails, Disney World, Events, Events, History, Hukilau, Magic Kingdom, Recipes, Resorts, Rum, Rum festivals, South Florida, The Week in Tiki and tagged cocktails, Disney World, El Dorado rum, Jungle Cruise, Magic Kingdom, Mai Tai, Miami Rum Renaissance Festival, N! Satterfield, Polynesian Resort, recipe, rum, The Intoxicators, Three Dots and a Dash, Trader Sam's, Walt Disney World. Bookmark the permalink. Thanks for the link to our photo tour! And, wow this is extensive coverage! Great job!